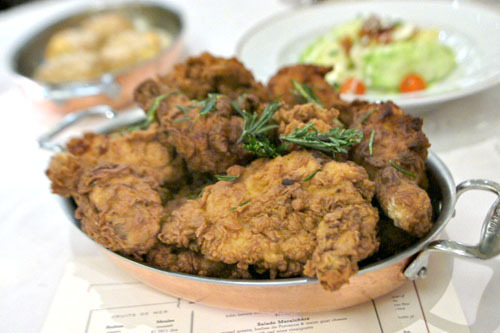 Fried chicken is just one of those things that--like risotto or uni--I just can't resist ordering when it's on a menu. And for the past several years, the version at Thomas Keller's Ad Hoc has served as my gold standard, a magnificent preparation of the bird that's pretty much the pinnacle of fried avian perfection in my eyes. I wasn't the only one smitten, and the chicken has turned into a thing of legend, even spawning its own do-it-yourself kit. Thus, I wasn't too surprised when it became a mainstay at Bouchon, popping up roughly once a month as the star of the show in always-packed fried chicken nights. 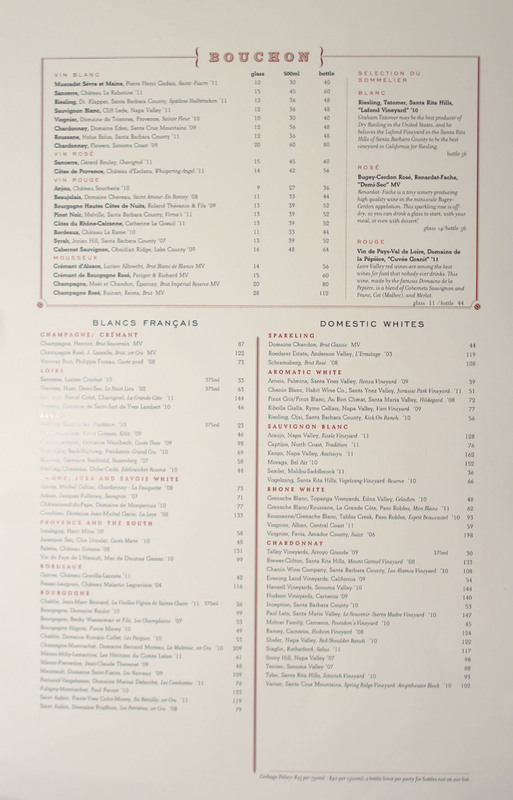 Now, just because it's poulet night at Bouchon, that doesn't mean the regular menu isn't available as well. We ended up doing the "ad hoc Fried Chicken, seasonal set" at $36 per person, with a couple of additional courses thrown in for good measure. Click for larger versions. 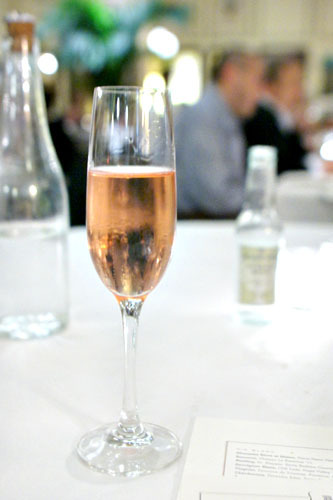 To wet our whistles, a bottle of bubbly was certainly called for, and we went with the Crémant de Bourgogne Rosé, Parigot & Richard MV [$60]. It was a fun, lively, easy-drinking sparkler to start, with a definite fruity sweetness to it and just a hint of countervailing minerality and yeast. 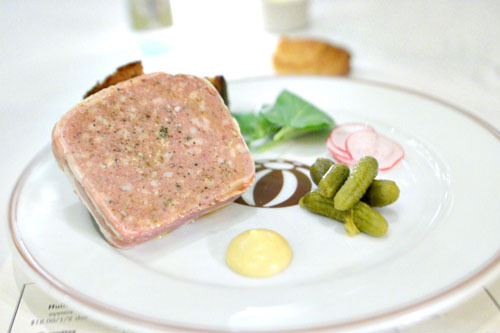 A French country style pâté was right on the money, with the forcemeat showing off a rustic, gritty consistency and a boatload of pork-y goodness, enhanced with just enough liver-y edge. Lovely alone, and even better when contrasted by a dab of mustard and some pickles. 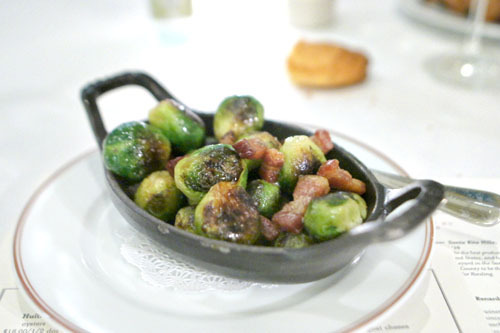 Brussels, meanwhile, were spot on: unabashedly bright and bitter, with a wonderful char and a great hit of salt from the bacon. 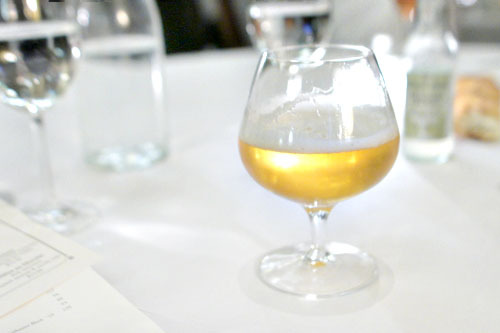 Sommelier Alex Weil sent out a glass of Belgian Blonde Ale, Anderson Valley Brewing Co., "White Apron," CA [$6], a floral, spicy, effervescent pale ale that happens to be produced exclusively for Thomas Keller restaurants. Note that this replaces the previous "White Apron," which was Czech Pilsener brewed by Russian River. 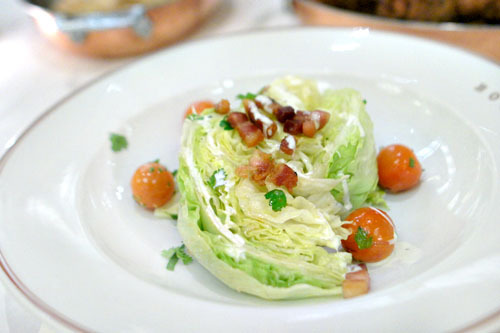 The iceberg brought a welcomed levity to the meal, with the crisp shards of the lettuce forming a fitting base on which the lardons, tomato, and buttermilk dressing could really sing. Utterly straightforward, but undeniably effective. 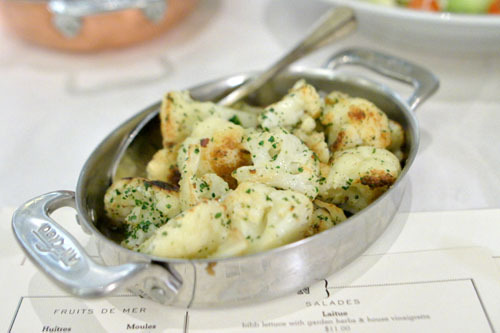 The cauliflower was prototypical in presentation, nicely done, but a touch on the soft side. 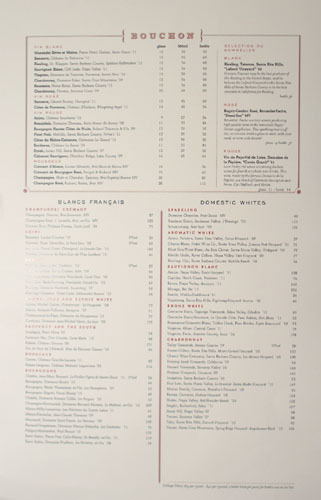 To go with our main course, we enjoyed a bottle of the Pernand-Vergelesses, Domaine Marius Delarche, Les Combottes '11 [$76], a gift from a diner at another table. 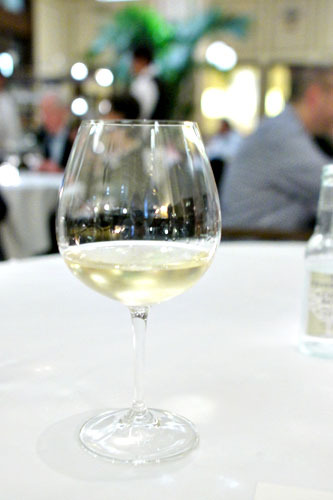 It was unmistakably white Burgundy in style, a tight, stony expression of Chardonnay that worked surprisingly well against the chicken. And now, we come to the evening's pièce de résistance, the much ballyhooed fried chicken. The bird is first brined in a lemon-herb mixture, then dredged in flour (with a mix of garlic powder, onion powder, paprika, cayenne, and Salt-n-Pepa), dipped in buttermilk, and then dredged in the coating once more before being fried. The end result of this effort was a delicious version of the American classic, with the rough, savory, delightfully crisp crust forming a fantastic complement to the tender, juicy, flavorful flesh within, all while the use of rosemary and thyme added a great herbaceous counterweight in the dish. I'd reach for the drumsticks first, but the white meat didn't give up much. 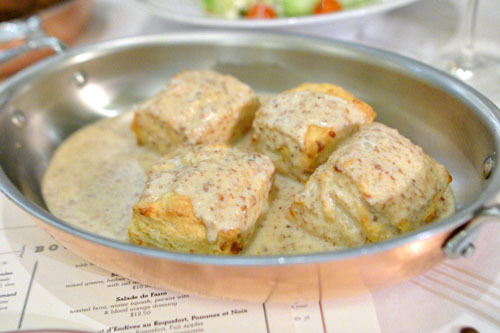 Biscuits were firm and dense, a bit monolithic alone, but a great vessel to soak up the hearty, mouth-watering gravy. For dessert, we went with quite possibly the best bread pudding I'd ever eaten. Its consistency was just what I wanted, a blend of fluffy, dense, and luscious textures that were imbued with a fruity, sweet spice. It was delectable by itself, but the two mounds of tart, tangy ice cream on top just sealed the deal. And finally, some macarons, in raspberry, green tea, peanut butter & chocolate, and vanilla flavors if I recall correctly. Overall, we had a lovely evening. The food was on point, nothing too fancy, nothing that shows off, but straightforwardly satisfying dishes that hit the spot. As for the oft-lauded chicken, it didn't quite reach the majestic heights of the bird at Ad Hoc (I have my doubts that anything will), but was tasty and comforting nonetheless--a must-try for every fried chicken fiend out there. oo. 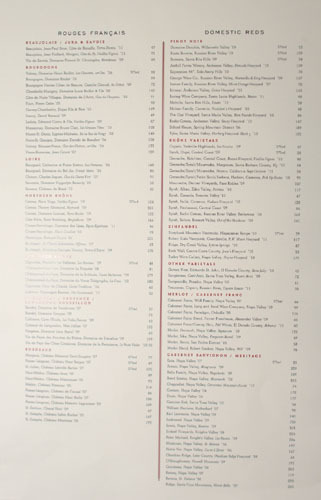 I didn't know they had the ad hoc chicken available - i missed i was in yountville. do they post the dates ahead of time? 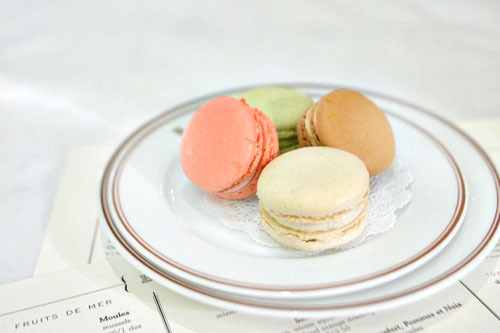 If my memory serves me correctly, the peanut butter macaron was actually pb & chocolate (I never forget a good macaron!) You're spot on with the other flavors, though. Next to the bottle of wine from the (drunk) diner who shall remain nameless, the bread pudding was the best part of the dinner. It further proves my theory that you just can't go wrong with rhubarb. Good times and excellent write-up as usual! I really have found that Bouchon is over rated. I love the other ones but something about going upstairs through a hotel turns me off. Andy: Ah, so we miss each other again. Were you there the 3rd or 4th? Your site says the 3rd, but this was on the 4th. 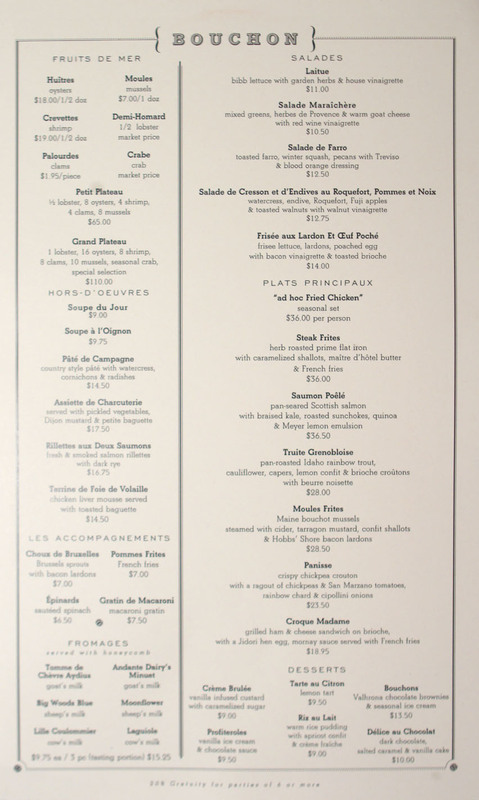 Clayton: The dinners are posted ahead of time on the Bouchon web site; see here (the next one is 4/1). 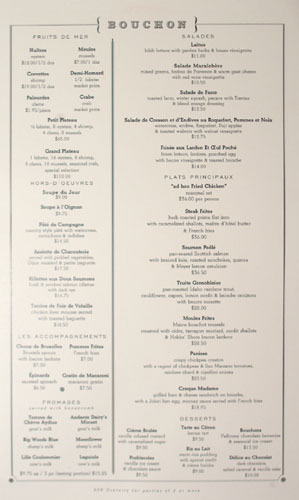 The food is solid bistro fare, if you're in the mood for such cooking. Jipeng: I actually like iceberg! It worked well given the circumstances here. Tuyet: Yes I do think you're correct; the change has been made. Thanks again for organizing! Anon: It's not actually a hotel though. That would be the building across the street, the Montage, which houses Scarpetta. It was the 4th, correcting now. We keep passing like ships in the night. Haha. I was there from 7:30 until 11:30, so I'm sure we overlapped. I bet we had better wine though. :-) The 1990 Close de Beze was drinking fabulously. 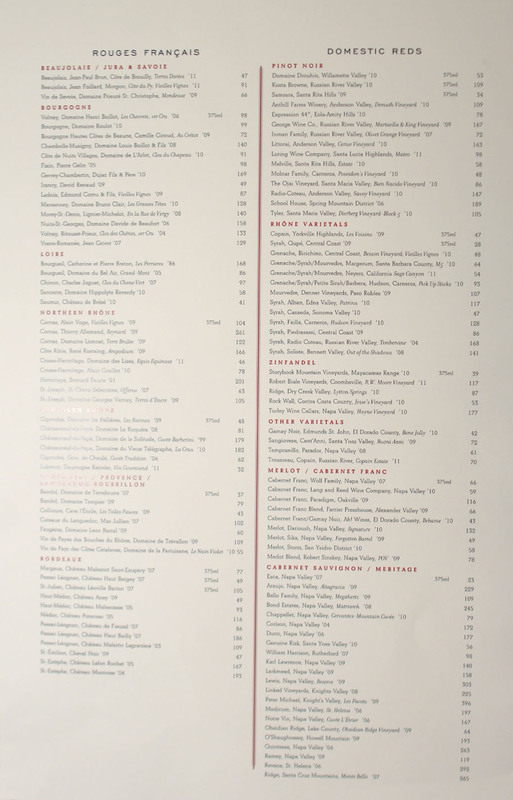 Last week we did a Faiveley dinner there too with about 20 great Burgs. I cried while eating it. 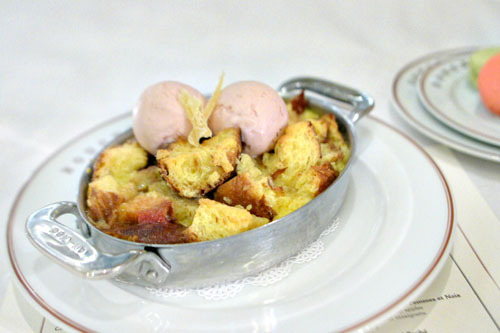 Bouchon just has a way of combining simplicity with such enjoyment. I should definitely go back. Andy: I'm sure you had better wine--you always do! Anon: I, too, returned here in the days preceding the ban. See my post on the experience here.